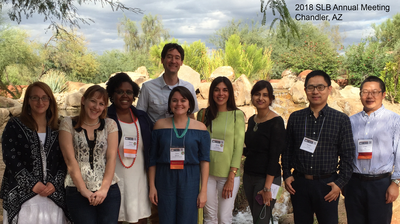 The Microbiology and Immunology Department was well represented by its graduate students at the 2018 Joint Meeting of the Society for Leukocyte Biology and International Endotoxin and Innate Immunity Society in October. Amanda Pulsifer (laboratory of Matthew Lawrenz) was one of three finalists for the SLB Presidential Award, which included the opportunity to present her research at a plenary session during the first day of the meeting. Katlin Stivers’ research (laboratory of Jay Hoying) was also highlighted and she was chosen to give a “Poster Flash Talk”. Irina Miralda (laboratory of Silvia Uriarte) won a SLB travel Award for her poster presentation. Finally, Hazel Ozuna (laboratory of Don Demuth) was selected to present her research at the Late Breaking Research Poster Session. Congratulations to all of the students! Tiva Vancleave, a graduate student in the laboratory of Dr. Matthew Lawrenz, has been awarded the 2018 University of Louisville School of Medicine Student Diversity Award. This award acknowledged Tiva’s commitment to the educational and societal needs of underrepresented minorities through mentorship and service during her PhD career. Tiva was recognized for this award during the 2018 PhD Commencement Ceremony, where she also received a Dean’s Citation for her PhD research on the YapE protein of Yersinia pestis. Hazel Ozuna, a graduate student in the laboratory of Dr. Donald Demuth, has been awarded a five year F31 Research Fellowship from the National Institiute of Dental & Craniofacial Research for her project entitled: "Exploitation of the host response by Aggregatibacter actinomycetemcomitans mediated by QseBC". Katlin Stivers, a graduate student in the laboratory of Dr. James Hoying, has been awarded a predoctoral fellowship from the American Heart Association for her project entitled "Regulation of Adipose Tissue Inflammation by Resident Myeloid-Derived Suppressor Cells". The two year award will fully support her research investigating the role of tissue resident, immunosuppressive myeloid cells in promoting immune homeostasis in healthy, lean adipose tissue and preventing the chronic inflammation that can lead to the development of obesity. Earlier this year, Katlin also received a travel award to give an oral presentation on her current work "Myeloid-Derived Suppressor Cells in Adipose Tissue Homeostasis" as part of the Kaley Lecture featured topic session, "The Complications of Diabetes and the Role of Inflammation: Mechanisms and Therapeutic Opportunities" at the Experimental Biology 2017 Conference, April 22-26, Chicago, IL. Amanda Pulsifer was awarded a “Best Poster Presentation” prize at The Yin and Yang of Phagocytes: Regulators of Human Health and Disease Gordon Research Conference, June 11-16, Waterville Valley, NH for her work entitled “Exploitation of Host Rab GTPases by Yersinia pestis Facilitates Intracellular Survival”. Amanda is a graduate student in the laboratory of Dr. Matthew Lawrenz.